Elaine Hancock (Olney, United States) on 6 June 2014 in Architecture. One of the barns at South Mountain Creamery. It is currently going under some repairs. It needs certainly some repairs but in the while, it looks great ! A fine example of 'repair as you go' ! Superbe cadrage qui mêle tout ces élements et ces couleurs! Great framing and rendering of textures & colors, love it! J'aime beaucoup le cadrage et toutes ces textures différentes!!!! at least they are going to save it. great. Beautiful colors, nice textures, Artistic ! Excellent way to fill the frame with great textures and leading lines!! Quel jeu de façades sueprbe quel rendu et vue merveilleux. I love how you composed this - the lines and textures are gorgeous! Very very supberb .. love those colors in that light, and compo is fabs ..! A wonderful composition Elaine !! 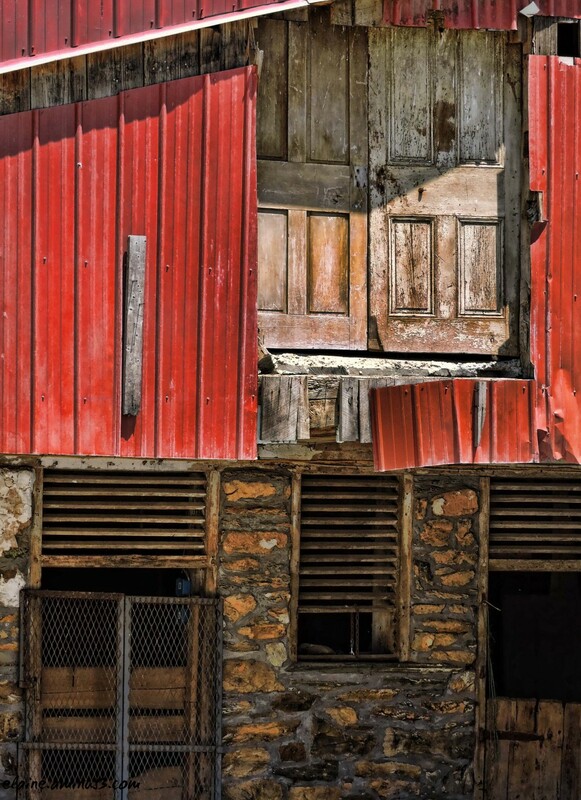 These old barns are amazing !! Great colors here !!! Great textures, colors and love the play on the eyes! Very well seen! @Ruthiebear: Thanks a lot Ruthie! I really appreciate it! @michel creze: Thank you Michel! la vielle grange t'a rendu grâce... félicitation. @Mohammad/Navvab: Thank you so much Mohammad! . . and a Color Feature Spot, too - well deserved, Elaine. @Baldwin Vandewalle: Thank you Baldwin! I really appreciate it. @Flagrant-declic: Thank you very much! @Etsu: Thank you so much Etsu! Congratulations on color Spotlight ! @Lena: Thank you so much Lena! Congratualtions on the Color Spotlight. @Kyu: Thank you very much Kyu! Great colours & textures ! @Eric C.: Thank you Eric! Superbes couleurs et très beaux détails! Félicitations pour le Spotlight! Bravo pour ton spotlight color!!!! @RBL: Thanks a lot Ruthie! I really appreciate it! @Eric Cousineau: Thanks a lot Eric! @Denny Jump Photo: Thanks a lot Denny! I really appreciate it. Hope you are dong well.